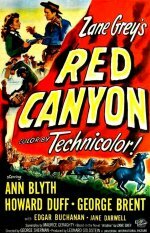 A charming western based on Zane Grey's novel Wildfire, with former radio actor Howard Duff playing a drifter trying to tame a wild stallion and falling for Ann Blyth, daughter of horse breeder George Brent. Blyth is particularly good, and there's an interesting supporting cast of western veterans such as Edgar Buchanan and Chill Wills, plus a youthful Lloyd Bridges. The Utah locations are beautifully shot by cinematographer Irving Glassberg.